David Hackett Fischer Receives Award for Lifetime Achievement in Military Writing | Armchair General Magazine - We Put YOU in Command! 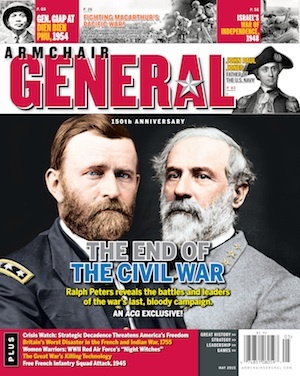 ArmchairGeneral.com received the following media release, and we extend our congratulations to historian David Hackett Fischer. CHICAGO, June 30, 2015—Pulitzer Prize-winning historian, best-selling author, and Brandeis University professor David Hackett Fischer is the recipient of the 2015 Pritzker Military Museum & Library Literature Award for Lifetime Achievement in Military Writing. The Pritzker Literature Award—which includes a medallion, citation, and $100,000 honorarium—recognizes and honors the contributions of a living author for a body of work dedicated to enriching the understanding of military history. Museum & Library Founder & Chair Jennifer N. Pritzker, a retired colonel in the Illinois National Guard, will formally present Fischer with the award at the organization’s annual Liberty Gala on Nov. 7 at the Hilton Chicago, where he will be joined by past winners. First presented to historian James McPherson in 2007, other past recipients—several of whom served as members of the award’s 2015 screening committee—are Allan Millett, Gerhard Weinberg, Rick Atkinson, Carlo D’Este, Sir Max Hastings, Tim O’Brien, and Antony Beevor. Author of 15 major publications on topics ranging from the American Revolution to the logic of historical thought, Fischer received the American Enterprise Institute’s Irving Kristol Award in 2006 for his “pivotal role in reviving popular and academic interest in American history and its lessons for the present.” Among his notable works are bestsellers and award-winners like Washington’s Crossing (Oxford University Press, 2004), a National Book Award finalist and 2005 Pulitzer Prize winner for history; Paul Revere’s Ride (Oxford, 1994), a 1996 Boston Globe Top 10 Book of the Year; Champlain’s Dream (Simon & Schuster/Knopf Canada, 2008), an internationally acclaimed biography published in English and French; and Albion’s Seed: Four British Folkways in America (Oxford, 1989), a groundbreaking study of the roots of essential American traits—a second volume of which is now in progress. A graduate of Princeton University (A.B., 1958) and the Johns Hopkins University (Ph.D., 1962), Fischer is University Professor and Earl Warren Professor of History at Brandeis University in Waltham, Massachusetts, where he has served on the faculty for more than 50 years. A recipient of numerous teaching awards over his long and distinguished career—including the 1990 Carnegie Prize as Massachusetts Professor of the Year and the Louis Dembitz Brandeis Prize for Excellence in Teaching—Fischer has held visiting professorships at Harvard University, The University of Oxford, the University of Washington, and several institutions in New Zealand. He and his wife, Judith Hummel Fischer, have two children and two grandchildren. The Pritzker Literature Award is sponsored by the Tawani Foundation. To learn more about the award or the selection process, or to watch 2014 Literature Award recipient Antony Beevor announce David Hackett Fischer as this year’s winner, visit www.pritzkermilitary.org. Founded by Colonel (IL) Jennifer N. Pritzker, IL ARNG (Retired), Tawani Foundation is a registered 501(c)(3) grant-making organization whose mission is to enhance the awareness and understanding of the importance of the Citizen Soldier; to preserve unique sites of significance to American and military history; to foster health and wellness projects for improved quality of life; and to honor the service of military personnel—past, present and future—through an awards program that includes the JROTC/ROTC Award for Military Excellence and the Pritzker Military Museum & Library Literature Award for Lifetime Achievement in Military Writing.